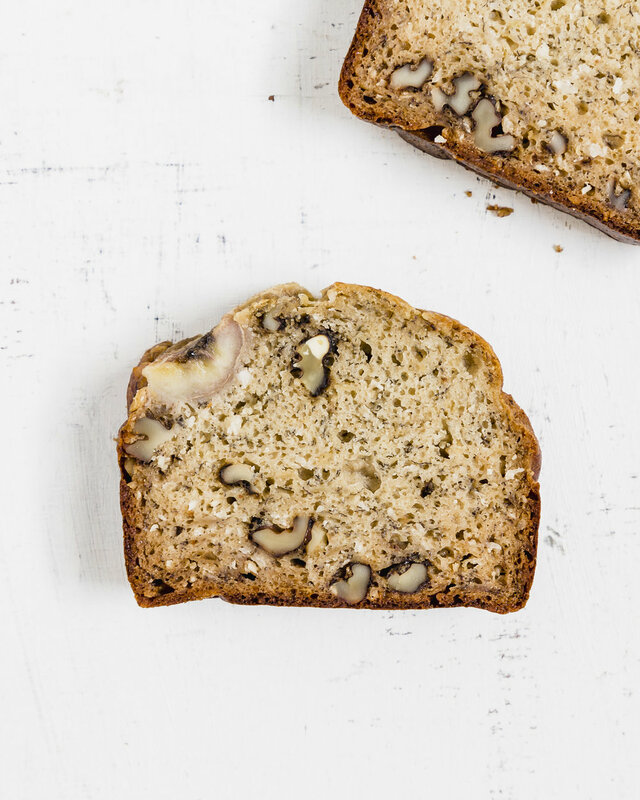 I am going to go right ahead an admit that I am addicted to this Coconut and Walnut Banana Bread! Its such a an easy to make recipe that I find myself making all sorts of variations to ready on the go for those busy mornings. Its super tempting to buy a slice filled with unhealthy ingredients with your morning coffee, I get it. I have done that any times in the past. But after I learnt how to make this easy recipe I dont feel bad eating two slices in a row. haha! So Dillon doesnt like walnuts or any kind of nuts in breads... yeah I know right? But I do so we came to an agreement and he just has to pick them out :p I have another recipe (will upload that soon) that uses oat flour and is equally delicious, also supe easy to make. If you don’t like walnuts, feel free to substitute your favorite kind of nut and even add chocolate chips if you want it extra decadent. I have tried to use less refined sugar in order to keep it relatively healthy. I suggest you keep this bread in the fridge after 24 hours to prevent it from getting moldy. In the colder months you can leave it out for 48 hrs dpeending on where you live. Preheat oven to 350 degrees F. Grease a 8x4 loaf pan and line with a parchment paper. Add mashed banana, eggs, ghee, maple syrup, greek yogurt, sugar and vanilla extract to a mixing bowl and mix with a paddle attachement till everything is combined OR add everything to a blender and blend till smooth. Allow bread to cool in the pan for 15 minutes, then remove and transfer to a wire rack to finish cooling.